This app is an interactive story book and is certainly one of the best that I have come across for quality of content in regards to the story and certainly in sound and graphic quality too. However there are also a couple of added bonuses that really add to the gameplay of the app and the learning that could take place throughout it too. Usually an interactive storybook is just that, a story that the user can interact with in parts but where a story is usually read out to the user. Sometimes there is an option for the user to read the book at their own pace and not have the app read aloud to them (this app certainly has that option) but that is as far as they usually go. However, Mother Gray and Little Blue is different in the sense that there are a number of different ways that the user can access the content, maximising the learning as they go along. The user has the option, as you would expect, to have the story read to them or for the user to read themselves. This is good in a story based app as it means that different ages and abilities can access the app and the same user can come back to the app and use it in a different way once they have become a more fluent reader. It can also be used as a way to help young children learn how to read as the words that are being read out are highlighted so the user can link the words to the sounds. However, unlike most story based apps, there is the ability for the user to click any word, whatever version it is in, and have the word read out loud for them. This really helps when it comes to learning how to read. Further to this, there is another fun, interactive element within the story where the user can click on the ‘Add to Story’ option on the homepage and as they work their way through the book, collect keys that open treasure chests on the page. This encourages the user to not only enjoy and interact with the story but also learn important visual literacy skills. They can be encouraged to look more at the pictures and the story they are telling, making inferences outside of those that the words are telling. Not only is this an enjoyable process, especially for a parent, but also one that engages the reader in developing the key skills that will help their development in not just reading through words but also reading through pictures. Overall this is an excellent example of a story book, based app and one that is elevated above its peers in the market by the added qualities that it contains. Both my 3 and 6 year olds enjoyed this app in completely different ways and my interaction with them also differed, giving the app a multi-dimensional quality that a lot of other apps lack. At Oken Studios we are passionate about creating beautiful apps which not only look great but also have strong educational values. All of the apps we create are carefully crafted to help children learn to read. We aim to combine the power of storytelling with animated interactivity to engage even the most reluctant of readers. 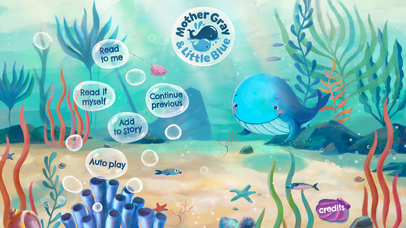 Taking our inspiration from the natural world, we have developed a new interactive story app, Mother Gray and Little Blue. 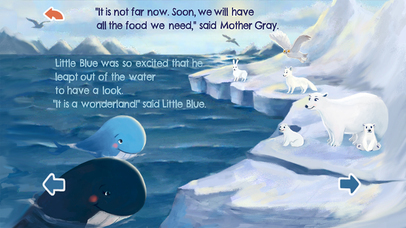 The story tells the tale of Little Blue, a baby whale who lives with his mother in the Pacific Ocean. Little Blue is taught about the world around him from his mother during their long migration north to winter feeding grounds. 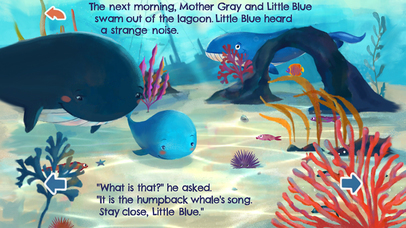 Mother Gray and Little Blue contains beautifully illustrated underwater scenes, and fun interactions and sounds. The story is fully narrated and also contains a wonderful original musical score which sets the mood and enhances the story. The language and sentence structure is simple, and the font has been specially selected because it has letter forms appropriate for beginner readers. Different modes allow you to have the story read to you by a narrator, or you can read it yourself. If your child is struggling to read a particular word, touch-to-read functionality allows your child to tap on the individual words to have them read out by the narrator. 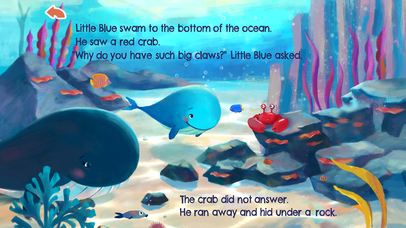 As well as helping children to read, the story can encourage them to learn more about the ocean and the creatures featured in the app. The four different modes available in the app - Read To Me, Read It Myself, Auto-Play and Add To Story - make the app appropriate for different ages and abilities, and enables it to still be used as your child improves their reading skills over time. The interactivity and engaging story means that children who may not enjoy reading can find something about the app that they like and through using it, develop their reading skills without the emphasis being on learning. In the creative ‘Add To Story’ mode, you can enrich the story by dropping additional items onto the page, many of which are animated and have their own sounds. Your child can add a mermaid or a submarine. All the while your child will be expanding their vocabulary and learning important visual literacy skills. Children’s privacy and security is very important to us at Oken Studios, and so none of our apps contain ads, in-app purchases or links to external sites.